WASHINGTON — Some of the noisiest Purple Line tunneling beneath Silver Spring, Maryland, homes finished Thursday, as crews broke through the end of the only tunnel being dug for the project. After months of grinding foot-by-foot toward Wayne Avenue — near Arliss Street and Flower Avenue in the Long Branch area — crews finally broke through on the west side of the 1,020-foot tunnel with a large remote-controlled demolition robot. The digging has shaken neighbors in the homes above, a problem that could become less common now. However, the tunnel is not yet complete. The digging done so far created the top two-thirds or so of the tunnel. 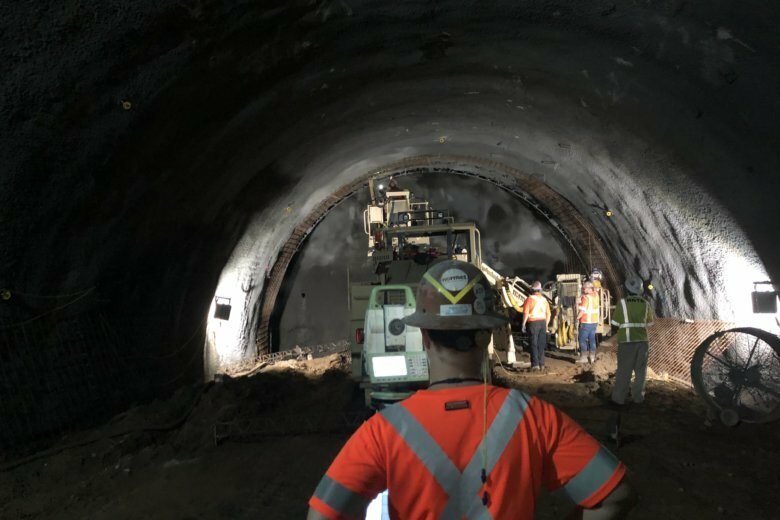 In the new year, crews will begin to excavate mud from the floor of the tunnel to create the space where the light-rail line’s tracks will sit. Earlier this month, crews ran a rescue drill in the tunnel that simulated a smoke-filled emergency during construction. Lane closures and other construction work will continue along what will become a 16-mile, 21-stop light-rail line connecting to the Metro system at Bethesda, Silver Spring, College Park and New Carrollton in Maryland. There also has been ongoing blasting recently in Bethesda, where trains will run in an existing tunnel under Wisconsin Avenue. The Purple Line is being built in Maryland and will be operated for the state by a private group known as Purple Line Transit Partners. It is scheduled to open by the end of 2022, barring any setbacks. Montgomery and Prince George’s counties hope for significant development around the line. Just this week the Federal Transit Administration awarded Maryland $2 million to plan for development and additional access to stations for people who want to walk or bike. The official Purple Line Corridor Coalition hopes to use the grant to coordinate development to limit the displacement of people and businesses that could see rents rise and to ensure significant development actually happens as planned.